Preliminary Part: Generalia. Section I: Historical Sketch of the Four Legal Systems. I : Outline of Each Legal System's History. II: Comparative Observations on the Historical Developments of the Four Legal Systems Section II: Sources of the Law under the Four Legal Systems. I: Sources under Each Legal System. II: Summary, Assessment and Comparison on Sources under the Four Legal Systems. Section III: Initiation to Contract(s); Development and General Traits. I: Genesis and Evolution of the Law of Contract(s). II: Law of Contracts and General Theory of Contract. III: Purview of the Law of Contract(s); and Related Conceptualisation, Terminology and Classification. 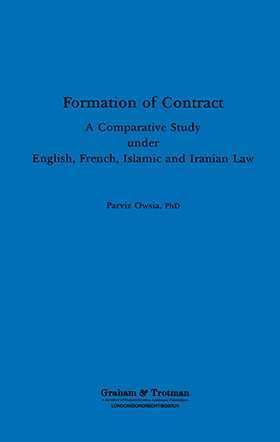 Part One: Basic Notions Relating to the Formation of Contract(s). Section I: Legal Notion of Psychological Elements. I: Range of Psychological Elements. II: Exteriorisation of Psychological Elements; Objectivity versus Subjectivity. III: Means of Expression of Psychological Elements. IV: Silence; Question of Efficacy. Section II: Function and Determination of Offer and Acceptance . I: Offer and Acceptance in French and English Law. II: Offer and Acceptance in Islamic (Shi'ah) Law. III: Offer and Acceptance in Iranian Law. IV: Summary and Comparison of the Doctrine of Offer and Acceptance under the Four Legal Systems. Part Two: Mechanism of Formation and Import of a Contract. Section I: Offer. I: Definiteness and Communication of Offer. II: Duration and the Question of Revocation of Offer. III: Termination of Offer. Section II: Acceptance. I: Certainty and Conformity of Acceptance. II: Correlation of Acceptance with the Offer. III: Communication of Acceptance; French and English Law Compared. IV: Communication of Acceptance under Islamic Law; Contrasted. V: Communication of Acceptance under Iranian Law; Compared with French and Islamic Law. VI: The Time and the Place of Acceptance and of Contract; Comparatively Treated. Section III: Import of a Contract. I: Minimum Terms Required. II: Interpretation. Appendices. Index.